Updated Feb/2019: Fixed issue where callbacks were mistakenly defined on compile() instead of fit() functions. First, we will define a simple MLP model that expects two input variables from the blobs problem, has a single hidden layer with 50 nodes, and an output layer with three nodes to predict the probability for each of the three classes. Nodes in the hidden layer will use the rectified linear activation function (ReLU), whereas nodes in the output layer will use the softmax activation function. Thanks for your post, and i have a question. I use adam as the optimizer, and I use the LearningRateMonitor CallBack to record the lr on each epoch. the result is always 0.001. Is that because adam is adaptive for each parameter of the model?? Is that means we can’t record the change of learning rates when we use adam as optimizer? Great tutorial Jason, as usual. Could you write a blog post about hyper parameter tuning using “hpsklearn” and/or hyperopt? Does it make sense or could we expect an improved performance from doing learning rate decay with adaptive learning decay methods like Adam? Not really as each weight has its own learning rate. Perhaps double check that you copied all of the code, and with the correct indenting. we cant change learning rate and momentum for Adam and Rmsprop right?its mean they are pre-defined and fix?i just want to know if they adapt themselve according to the model?? We can set the initial learning rate for these adaptive learning rate methods. 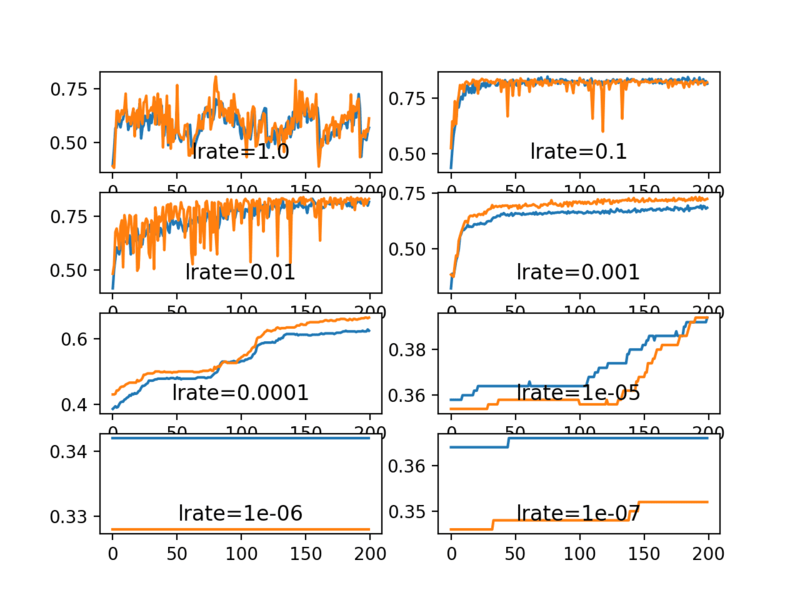 When lr is decayed by 10 (e.g., when training a CIFAR-10 ResNet), the accuracy increases suddenly. Can you please tell me what exactly happens to the weights when the lr is decayed? For example, one would think that the step size is decreasing, so the weights would change more slowly. But at the same time, the gradient value likely increased rapidly (since the loss plateaus before the lr decay — which means that the training process was likely at some kind of local minima or a saddle point; hence, gradient values would be small and the loss is oscillating around some value). So, my question is, when lr decays by 10, do the CNN weights change rapidly or slowly?? Thanks. Any thoughts would be greatly appreciated! When the lr is decayed, less updates are performed to model weights – it’s very simple. When you say 10, do you mean a factor of 10? If you subtract 10 fro, 0.001, you will get a large negative number, which is a bad idea for a learning rate. Thanks for the response. I meant a factor of 10 of course. A decay on the learning rate means smaller changes to the weights, and in turn model performance.